These Mosquito Repellent Bracelets by Pure Garden deliver an easy and all-natural solution to pesky bugs, mosquitos, and insect bites. With 5 bracelets included, the entire family can benefit from the deet-free formula, constructed with powerful citronella to be a non-toxic safe alternative to bug spray or lotion for adults, kids, toddlers, and even pets! Great for camping, hiking, picnicking, and all other outdoor activities to protect against pesky mosquitoes! SATISFACTION GUARANTEED- Pure Garden is committed to providing the consumer with the absolute best price and value on our entire line of products, which we ensure by applying a rigorous quality control process. 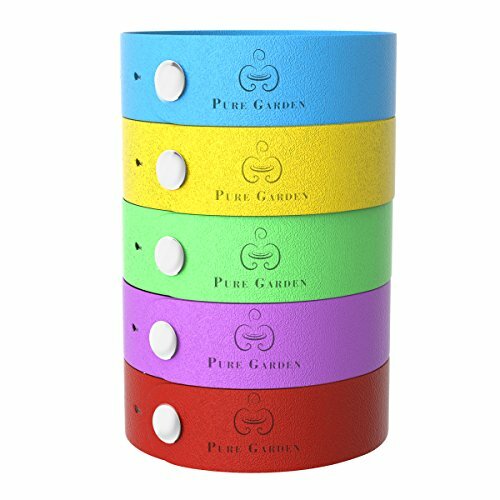 NOTE: This is an exclusive product of Pure Garden and ONLY Mosquito Repellent Bracelet, 5 Pack by Pure Garden are GUARANTEED to be genuine IMPORTANT: Avoid buying counterfeit products and transacting with unauthorized sellers. Look for our logo on the packaging for every one of our products. PRODUCT DETAILS- This set included 5 wristbands of colors blue, pink, yellow, green, and orange. Dimensions: .75" width, adjustable length to fit wrist sizes 5.5"-9" around. Made with an all-natural citronella oil formula that lasts up to 15 days.